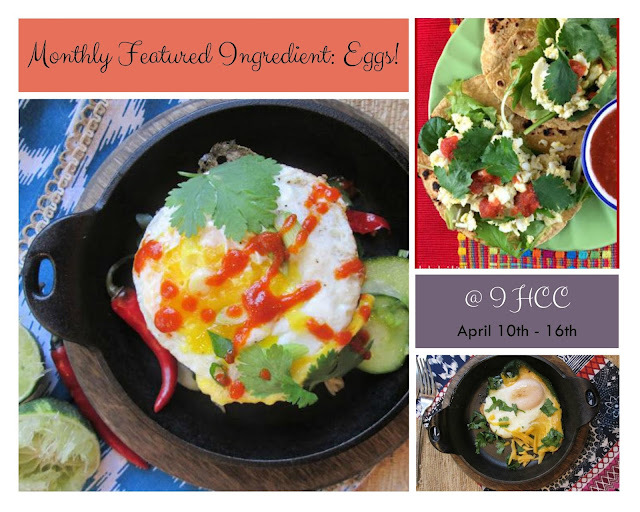 Okay friends, so this week we're celebrating the wonderful and versatile world of eggs over at I Heart Cooking Clubs. Since eggs are one of my favorite ingredients I knew that I wanted to come up with a special dish, something more original. After browsing through hundreds of egg recipes this week I ended up taking inspiration from Jamie Oliver's Mexican Fried Beans served with beautiful poached eggs on top. Now, believe me, I use the term "inspiration" loosely. My inspiration comes in the form of being lazy. So there I am standing over the black beans in my cast iron pan and I'm thinking...I do not want to get out another pan and mess with the fussy poaching of these eggs SO...what can I do to get around that? A simple glance over at my cast iron casserole dishes gave me the answer. Bake it! This solved two dilemmas. The first being the fussy poached eggs mentioned above. The second being the lack of cheese in Jamie's recipe. Problem solved! Baking this dish makes cooking the eggs and adding cheese a cinch! So, it went like this. Add a diced jalapeno, clove of garlic, and handful of cilantro to a skillet with a touch of oil and butter and allow to soften. Stir in the drained black beans until mixed with jalapeno mixture and warmed. Spoon mixture into ovenproof casserole dish, or dishes. At this point I wanted cheese so I dolloped about a tablespoon of cream cheese evenly over both casserole dishes. You could use any cheese you like. Take a tip from me and use whatever cheese you see first or whatever cheese is the easiest, because, you know...that's how it is. Then top with four eggs, or if making individual dishes, then two eggs each. If you want to be all dainty then you can even make four servings. Totally up to you. Bake at 350F according to how you like your eggs. In all, I think 10 minutes is a good jumping off point. Then garnish to your liking, but do not leave off green onions. I didn't add them to this dish and wish I had! They bring it all together. Serve immediately! This comforting and satisfying dish would be perfect for so many occasions. Today it was the perfect consolation prize after my ten year old son woke up at 5:30 and couldn't go back to sleep. What can I say....nothing will wake a kid up faster than Easter candy! In a skillet, add the oil and butter. Once butter is melted add in the diced jalapeno, garlic, cilantro, and salt and pepper, to taste. Cook until the jalapeno is softened, 1 to 2 minutes. Once softened, add the rinsed and drained black beans, mixing together the jalapeno mixture with the black beans until warmed through. You can add the cheese at this point and mix it through the beans OR add the beans (dividing the beans) to your ovenproof casserole dish and add the cheese on top of the beans. Your choice! At this point you could also add additional cilantro, salsa, red onion or green onion OR not. Again, this is your bowl and your choice. They can be customized to your liking! Add two eggs to the top of the beans and again, your choice....garnish the eggs to your liking if you chose. Bake the eggs to your liking. Again, if you like your eggs over easy then bake for around 9-10 minutes. If you like them overhard, bake for around 12 minutes. Remember, depending on the size of your egg, the times will vary so carefully watch your eggs! I used 4 extra large eggs because it's what I had on hand and baked mine for 12 minutes. Once the eggs are to your liking, quickly garnish the dish with whatever you chose. It's worth noting that green onions should be a must! Their flavor really rounds out the whole dish. Serve immediately, with warm tortillas. If you've been with me awhile, you know I am absolutely crazy for eggs! In fact, eggs are my go to when all else fails. I always have them on hand and I can almost always put together an amazing egg dish with very little ingredients. Below are some of my current favorites, in order. If you make one, let it be Jacques Pepin's Egg and Onion Gratin. It is surprisingly delicious. Click on recipe names below to be directed to the original post. This humble dish will surprise you. Hard-boiled eggs tossed in a creamy Gruyere cheese and onion sauce....trust me, this is heavenly! In fact, it is one of my hands down favorite dishes on my blog! Serve a little bit of of the gratin on a slice of toast and you will be in for a mind-blowing treat! Jacques Pepin sure does know how to write a tasty egg recipe and this one is certainly a favorite. Easy, healthy, and simple this is a breakfast I could wake up to each morning. An egg baked into a softened poblano pepper and then topped with cheese. It really hits the spot! In my opinion, you simply will not find a tastier quiche or breakfast casserole than Giada's Breakfast Tart! This one packs a punch in the flavor department with a hefty dose of pancetta and green onions and it is extremely creamy and cheesy with both Mascarpone and Gruyere. Perfect for entertaining! It is hands down incredible. Definitely worth a little extra fuss in the morning. If you're suffering from the effects of a long night out, or simply in the mood for something light and healthy, Jamie Oliver's Nasi Goreng is a unique and tasty way to start your day! A fried egg sits atop a spicy fried rice mixture with some fresh pickles on the side. A bright and snazzy meal that will really wake you up and put some pep in your step! Donna Hay's Potato and Ham Fritters are a must make with your leftover Easter ham. Fluffy little cakes of mashed potato, peas, and bits of ham come together with a crispy crust to bring you all kinds of spring goodness on a plate. I love to dip these in a little Dijon mustard, but they are fabulous on their own. A must make this spring! What's your favorite egg dish? I could eat all your gorgeous eggs; such tempting photos! Easy is good, we don't have a fleet of sous chefs after all. My favorite goes to the creamy and cheesy tart both Mascarpone and Gruyere. It's mouthwatering good, on paper and in my mind. Genius! I can't tell you the number of times I opt to scramble or bake eggs rather than poach them because I just can't be bothered with boiling water. My laziness often astounds me. But hey, this looks like an equally delicious alternative! You outdid yourself on the egg presentat! I would grab that Giada breakfast tart in a hurry. The Donna Hay recipe looks good too. One of my favorite fry ups is precooked ( leftover) potatoes I a skillet with chopped veggies and the adding eggs. It's easy, it's one pan and it's colorful. Hope you are doing well, Kim. Thanks so much for taking the time to leave a comment! At the moment I am having a huge problem with spam so I've had to add comment moderation and close off comments to anonymous users. I apologize for the trouble and hope to return my comments to normal shortly. My Top Five Heidi Swanson Favorites! Soup, Salads, and Sandwiches Every Sunday!